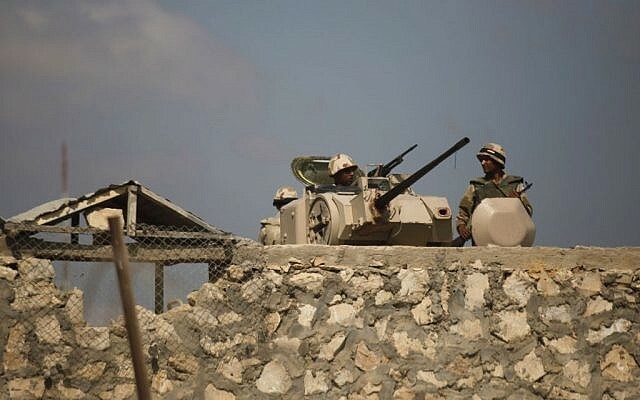 Egyptian forces battled suspected terrorists in the Sinai Peninsula over the weekend, continuing the latest operation designed to stem violence in the restive region. Security officials said Saturday they uncovered explosives aimed at an Egyptian border post near a tunnel, with a detonating wire leading back through the passageway to Gaza. Military intelligence officials said the discovery was another sign that Gaza-based militants were involved in attacks on Egyptian security forces. The officials spoke on condition of anonymity because they were not authorized to speak to the media. For the fourth consecutive day, Egypt kept the Rafah crossing on the Gaza border closed Saturday, the Palestinian Ma’an news agency reported. On Wednesday, a pair of suicide bombers rammed their explosives-laden cars into military targets along the Gaza border, killing at least nine soldiers and wounding 17 people, security officials and a military spokesman said, leading to the closing of the crossing. One of the two bombings in the town of Rafah brought down a two-story building housing the local branch of military intelligence, while the other struck an army checkpoint. At sunrise Friday, helicopter gunships targeted suspected Islamic militant hideouts in a number of villages south of the town of Sheikh Zuweyid and farmlands near the city of el-Arish, a military official said. Sheik Hassan Khalaf, who lives in a village some five kilometers (three miles) from the targeted areas, said that he saw smoke billowing in the sky after hearing loud explosions starting from 5 a.m. Earlier, tribesmen expressed anger over two elders being accidentally shot and the military demolishing homes in middle of the fighting. “Those Takfiris are hiding in middle of the residential areas. It’s a war and it is very possible that people get shot in the middle. This is unavoidable,” Khalaf said, using an Arabic term for extremist Salafists. Friday’s attack is part of a new offensive launched last week by the Egyptian military in the Sinai. The offensive comes after more than 70 police officers and soldiers were killed by militants. In the worst single attack, gunmen pulled police recruits from buses, ordered them to lie on the ground and shot 25 of them to death on August 19. A total of 29 militants were killed in a three-day military offensive that began September 7. Officials did not immediately offer casualty figures for Friday’s offensive. Also, a group called Jund al-Islam claimed responsibility for the suicide car bombings in a town bordering with Gaza Strip that killed six earlier this week. In a statement posted on Islamic websites late Thursday night, Jund al-Islam said that the attacks came in retaliation for “el-Sissi militias of traitors (in) the Egyptian army” who are launching “a direct war against Islam.” The message refers to Egypt’s Defense Minister and Military Chief Gen. Abdel-Fatah el-Sissi. The statement appeared identical to an earlier statement by another Sinai-based group, Ansar Jerusalem, which claimed responsibility for the failed assassination attempt on Egypt’s Interior Minister Mohammed Ibrahim last week. That attack, in the heart of Cairo, killed one person and wounded more than 20. The minister escaped unharmed.